Reigning European champion Maxim Matlakov (Russia) and his countryman Dmitry Gordievsky will participate in the 80th edition of the Tata Steel Chess Tournament in January. Matlakov will participate in the Tata Steel Masters and Gordievsky in the Tata Steel Challengers. They have earned their invitations because of their ranking in the ACP competition. The field of participants of the Tata Steel Chess Tournament is now complete. Both the reigning world champion (Magnus Carlsen) as well as the new junior world champion (his countryman Aryan Tari) will participate in Wijk aan Zee. The best female grandmaster, Hou Yifan, will also participate. 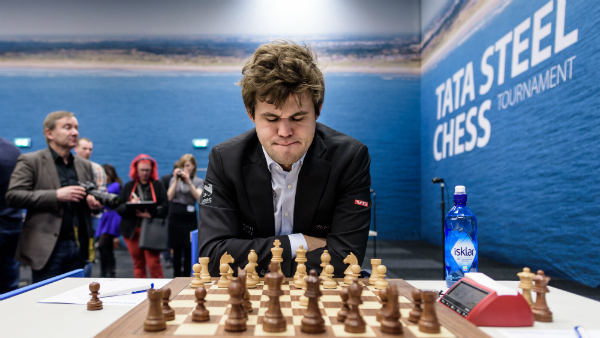 The 80th edition of the Tata Steel Chess Tournament will take place in Wijk aan Zee from 12 – 28 January 2018. As part of Tata Steel Chess On Tour the Tata Steel Masters will play a round in Beeld en Geluid in Hilversum on Wednesday 17 January and a round in the Academiegebouw of Groningen University on Wednesday 24 January. All matches, including the ones in Hilversum and Groningen, are open to the public free of charge. Matlakov and Gordievsky will debut in Wijk aan Zee. Matlakov (26) ranks 23rd on the world list. The biggest success of his career so far was winning the European championship in Minsk earlier this year. His countryman Gordievsky (21) is still relatively unknown in the West. He became grandmaster earlier this year and has won the Moscow Open, finishing ahead of strong grandmasters like Kamsky, Khismatullin en Grachev. For information about the Tata Steel Chess Tournament, go to: www.tatasteelchess.com.